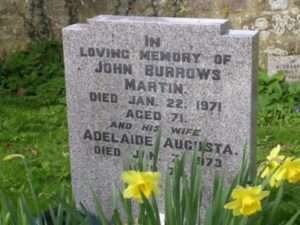 Uncle Jack and Auntie Gus; their polished granite headstone in Huish Episcopi churchyard does not tell a fraction of the story. In memory, they were an old couple. They would be sat in two armchairs beside a warm coal fire. Uncle Jack would keep a supply of cigarettes in a wooden bureau. The two shilling piece from my grandfather would release a packet of twenty that had to be run with back to the farmyard. Uncle Jack walked with some difficulty. It would not have been polite to have asked “why?” No-one ever told me the story of what had happened until long after he had died, by which time it was too late to have asked him about his memories, though, being a quiet and modest man, he would probably never have told them. It is odd now to look at their ages. They seemed so old, yet in the first memories of him he was only at retirement age. He died when he was 71, Auntie Gus when she was 73, and people thought they had lived to a good old age. Perhaps they had, perhaps their memories of youth were so powerful that it would seem to them that they had lived many, many years. They were engaged at 16. Imagine dying at the age of 71 and having been committed to the same person for 55 years. Those were days when “youth” had not really emerged as a concept; “childhood” emerged in Dickens’ time, and “youth” would develop its own identity with groups of young people from the 1930s onwards. In 1916, being sixteen years of age was to be an adult. The Great War was at is height and Uncle Jack joined the army and was sent to the Western Front. The official age for enlistment was eighteen, but there were many younger than Jack in the trenches. Jack was captured by the Germans, but appeared on no prisoner of war lists. Everyone presumed he was dead: Auntie Gus refused to believe this could be so, “I knew he was alive” . The young Augusta, clung on to the belief that one day he would come back and they would be married. The war ended in November 1918 and there was no sign of him. He was to return home in 1919. He walked back through the chaos of post-war Europe from the coalmines in Poland where he and many others had been working as forced labour. Leaving the mines, he had no identity papers and tied rags around his bare feet, and walked a hundred miles before finding someone who could assist him in his journey homewards. There was a family story that he was carried through the streets of Langport, shoulder high, when he came home. Who knows? Maybe it was one of the few happy stories from those bleak times. The Great War had been followed by the Spanish Flu, which had claimed more victims than the fighting, taking its heaviest toll amongst the younger and fitter whose ranks had already been reduced by the conflict. Uncle Jack and Auntie Gus lived more of life between 1916 and 1919 than many people would in decades; how would one ever tell such a story in stone?